Hampton University’s Master of Science in Information Assurance (Cyber Security) degree has been named one of the nation’s top schools for an online Master’s Information Assurance degree by CyberDegrees.org. HAMPTON, Va. (February 8, 2019) – Hampton University’s Master of Science in Information Assurance (Cyber Security) degree has been named one of the nation’s top schools for an online Master’s Information Assurance degree by CyberDegrees.org. “The work being done in our Department of Computer Science is absolutely extraordinary. The Department continues to uphold the highest standards upon which Hampton University was built. Congratulations to the faculty and leadership for this honorable distinction,” said Hampton University President, Dr. William R. Harvey. CyberDegrees.org launched in 2013 and has become one of the most trusted online resources on students interested in cyber security education and careers. They are noted as a resource by various colleges around the nation, and organizations like the National Cyber Security Alliance and the Internet Security Alliance. The site also has useful resources for those interested in moving from IT jobs into cyber security careers, guides to security clearances, and more. This recognition, for Hampton University’s Master of Science in Information Assurance (Cyber Security) degree program, comes after Hampton University’s Bachelor’s in Aeronautics and Aviation program was named one of the best online programs on TheBestSchools.org, and Hampton University was ranked No. 5 in Virginia from OnlineColleges.com, as one of the Top Online Colleges of 2018. The MS in IA is housed in the Hampton University School of Science, in the Department of Computer Science and the Information Assurance and Cyber Security Center (IAC), under the leadership of Dr. Chutima Boonthum-Denecke, Professor for the Hampton University Department of Computer Science and Chief Security Officer. The initiative for the Master’s in Information Assurance started over ten years ago by former Computer Science Department chair, Mr. Robert Willis, who is currently an adjunct professor for the department. When this initiative originally started, the department awarded certificates to students in cyber security. After Dr. Boonthum-Denecke and current Department Chair, Dr. Jean Muhammad came on board, they were able to continue the efforts and it has now evolved into a Master’s degree in Information Assurance under the Hampton University Department of Computer Science. The program itself focuses on providing a broad interdisciplinary information assurance education that prepares graduates to successfully defend, protect, design, implement and maintain secure information and information systems. Dr. Boonthum-Denecke was appointed by the department chair to take over as Chief Security Officer for cyber security for the Department of Computer Science in 2014. “She has done a fabulous job spearheading this venture, and has worked tirelessly, with the help of the departmental faculty who teach these courses online with the adjunct professors, Mr. Willis, who originally began this venture, and Mr. James Talley, a former FBI agent who is a digital forensics expert. With their continuous support, we are able to keep the high level of standards required to maintain the Center of Academic Excellence in Cyber Defense Education (CAE-CDE), designated by NSA and The Department of Homeland Security. This is a departmental collaborative initiative, which shows the dedication and commitment from everyone and this recognition demonstrates that,” said Dr. Jean Muhammad, Chair of the Hampton University Department of Computer Science. Hampton University also participates in the CyberCorps: Scholarships for Service program, which includes funding for Hampton’s Graduate Education Scholarships in Information Assurance (HU GETS-IA) Program. This scholarship covers tuition & fees, books, professional development, health insurance costs, plus students receive a generous annual stipend. “It’s so important to receive recognitions like these because staying current under the designation by NSA and Homeland Security, allows programs like the NSF CyberCorps: Scholarships for Service program to exist. We are very selective about the students who receive this scholarship because we want to make sure they’re committed to the program which inspires them to work for government agencies,” said Dr. Boonthum-Denecke. “Congratulations to the entire Computer Science Department. There is no better endorsement than an unsolicited one. 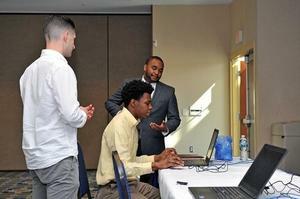 Keep up the good work!” said Dr. Calvin Lowe, Dean of the Hampton University School of Science. For more information about the Master of Science in Information Assurance degree, contact the Hampton University Department of Computer Science at 757-727-5552.